In this article, we will create a Custom Metric using Adobe Analytics Query Builder to highlight key features and functionalities of the tool. Our goal is to filter the number of Visits from iOS by Page. Custom Query Name: Write a name for your Custom Metric in this field. You will find this name/title as a Metric option in the Designer after saving the query. We chose "Visits by Page (iOS)" for our query name. Segments (optional): Segments allow you to identify subsets of visitors based on characteristics or website interactions identify who your visitors are (country, gender), what devices and services they use (browser, search engine, mobile device), where they navigated from (search engine, previous exit page, natural search), plus a lot more. For example, out of your entire set of users, one segment might be users from a particular country or city. Another segment might be users who visit your page and came from specific device, as in our example (iOS). Read more about Segments in Adobe Analytics. Elements (optional): Data elements are the building blocks for rules. Data elements let you create a data dictionary (or data map) of commonly used items on a page, regardless of where they originate (query strings, URLs, or cookie values) for any object that is contained on your site. It is possible to filter data by elements with a Query Builder and Elements are automatically shown in Dropdown. 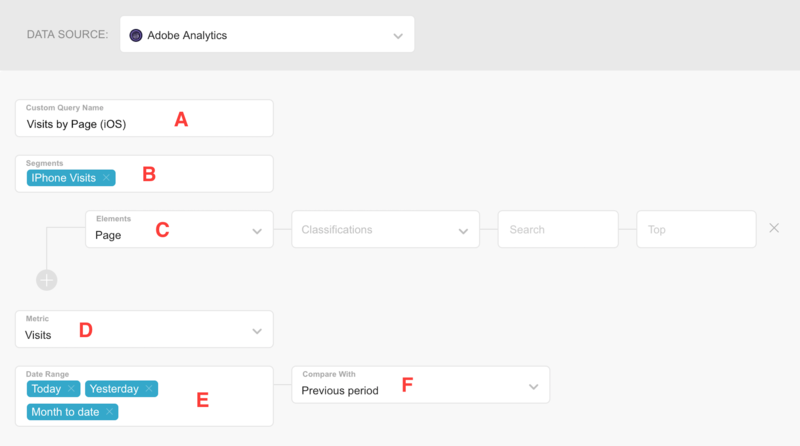 Check more about Data Elements in Adobe Analytics here. 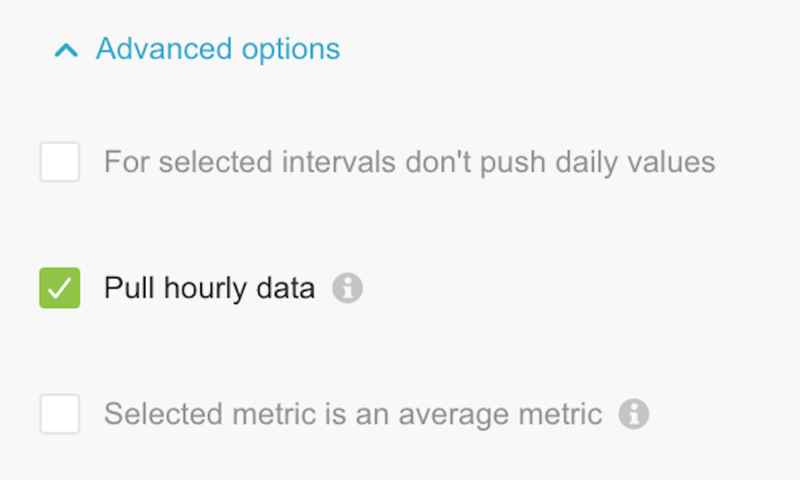 Metric (required): Select a metric from your connected Adobe Analytics data source, such as Bounce Rate or Visits . A metric can be used in combination with other elements or segments, but only where valid combinations apply for that metric. Date Range (required): To display your data the way you like, you will need to choose a date range. Just click on the "Date Range" field. Selected intervals will be enabled for a new metric. In "Advanced options" you can find three different checkboxes which can help you build custom metric and customize data as you want to use it. For selected intervals don't push daily values: In case we won't use line or bar charts with created metric and "today" and "yesterday" date ranges are not selected, we only need total values for selected date ranges. 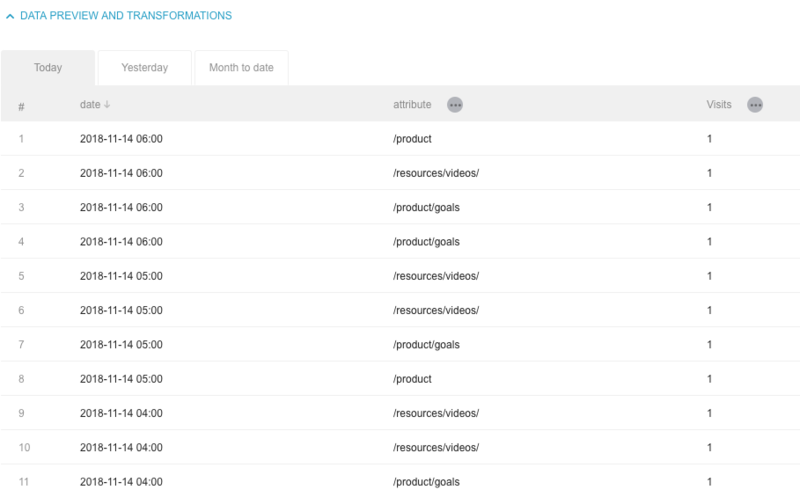 Pull hourly data: By default we don't pull hourly data for Abobe Analytics. This setting only applies to Today and Yesterday date ranges. In our example, we select "Pull hourly data" option, because we want to use daily linechart visualisation, to see new customers on hourly basis. By default, a metric will be added in the dData Source where data is pulled. It is possible to change the target datasource by clicking on "Change target data source" on the top right. It is possible to rename Dimensions (best practice is to rename them before saving the query) by clicking "..." next to Dimensions and then selecting "Rename dimension".